Particles ejected from a supermassive black hole are caught up in a galaxy merger, blasting the material even more powerfully into space. A supermassive black hole ejects particles that are swept up by a galaxy merger and flung outward even more quickly. 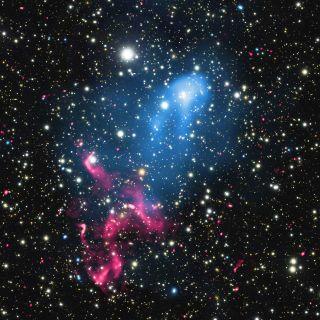 This image incorporates X-rays detected with the Chandra X-ray Observatory, radio waves detected with the Giant Metrewave Radio Telescope and optical data from the Subaru Telescope.